50% down payment gets you started! See Payment Plan for more information. Note: All prices are estimates. Actual pricing will be based on agreement of scope of project. Any hours spent over actual agreement will be billed at $49.50 hr per an ammended agreement. Custom images, logo design, additional web pages, additional email addresses and customization available upon request. NOTE: All Website Design Packages 1st payment are eligible for No Payment + No Interest if paid in full in 6 months OAC. Click here to view all of our Terms & Conditions. 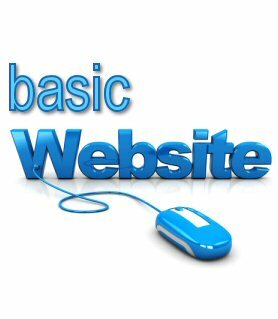 Basic Website Design is an affordable way to provide your business or organization with an attractive and descriptive web presence. Note: Custom images, logo design and additional web pages and customization available upon request.